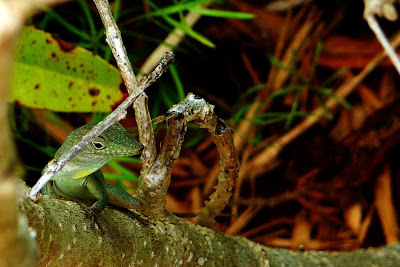 Skulking through the understory near my hotel room in Bermuda, this little non-native Jamaican turquoise anole (Anolis grahami) reminds me that even in the middle of a hectic work day - even in the most unexpected places - nature abounds. 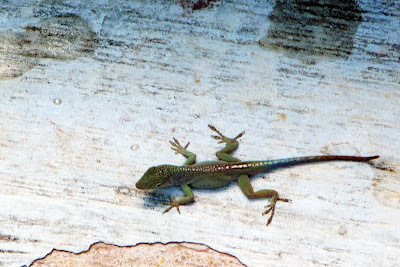 Even if its out-of-bounds -- Jamaica is far, far form here my little multicolored friend. This may be as close as I ever get to the ocean this week - on location we're on the clock 24/7. I stop every chance I get, though, to marvel at this turquoise blue water. I walk by this vista a dozen times a day and every time I am still not prepared for how it will take my breath away. We live in a rich, rich, colorful world -- if only we would take time to notice it. I stop to breath in turquoise - it gets me through this long day of air conditioned ballrooms, moldy carpet, and the vastly over-perfumed. or flush a turquoise-tailed lizard from under my chair. The virtual world of nature is never faraway, either. Often, if feeling overwhelmed by spread sheets and memos and mail merges - I sneak off for a moment and visit my friends in the nature blogworld and discover that Motmot's painting some marvelous looking bird in a Panamanian rainforest, Zick and the Baker are sniffing out morels on Indigo Hill; Mary is working rat snake patrol for a couple of lazy lizards and Doug has found an atlas moth. These friends and their discoveries also get me through the day. 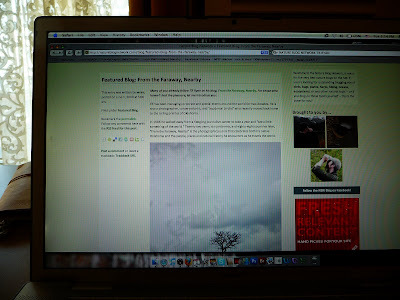 Yesterday I toggle the keyboard and up comes The Nature Blog Networks Featured Blog: From the Faraway, Nearby. Hey! That's me. 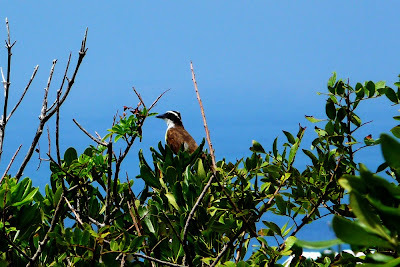 Thank you, Wren, for the interview and the opportunity to be featured on the Nature Blog Network. I am extremely proud to be a part of this incredible community of nature bloggers. The Nature Blog Network is now home to 932 blogs dedicated to bringing the very best of the natural world. Be sure to stop by and check out a few. Two nights ago an early evening storm here gave way to sky full of mangoes and raspberries. The perfect dessert with which to end the night. 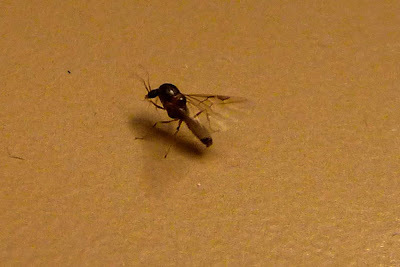 The cool damp air brought in a couple of these little flying guys toward the brightly lit desk lamp - gnats? ants? wasps? I had no idea but I was fascinated. Now, let me show you Nature Blog Networking in its finest moment. I am marveling the odd shape of this phenomenal looking little bug. At just that time my Skype icon chimes on the computer alerting me that a mutual friend is in the room. I take a peek - there is Debby Kaspari, nature blogger extraordinaire, fresh off the plane from the jungles of Panama instant messaging me from home in Oklahoma. I'm telling her about these ant-wasp-gnat creatures that are converging all around me. She says take a pic. I do and email it to her while we are in full chat mode catching up on our respective travels and time away from home - she whips the photo off to her husband Mike Kaspari, a renowned ant ecologist, who at that moment is black lighting for queen ants in a pitch black forest in Panama and he makes a positive ID: a male dolichoderine*. 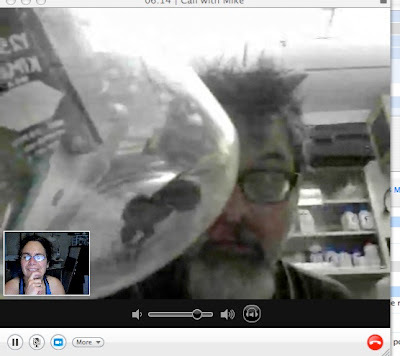 Lower right, Nature Blogger Debby Kaspari in Oklahoma video chats with ant ecologist Mike Kaspari, holding a ginormous queen ant, in a field lab in Panama while TR in Bermuda listens in via Skype chat. 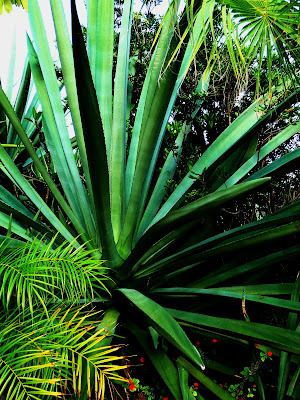 From a hotel desktop in Bermuda my little ant goes to Oklahoma for inspection and is instantly forwarded to the jungles of Panama to be examined by an ant expert who is Zero degrees removed from E.O. Wilson! This is nature blog networking at its finest! Indeed, we are part of an extraordinary community. 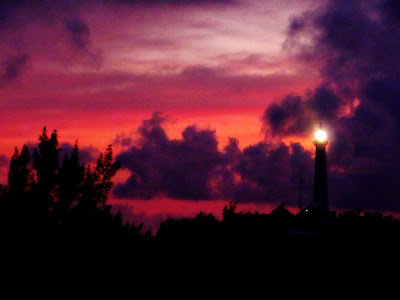 Tomorrow - my last day in Bermuda - I cannot wait to get back home. Purple coneflowers are calling, the butterfly bushes must be in full bloom and the passion flower vines are surely arching over the deck by now. *Dolichoderinae is a subfamily of ants, which includes species such as the Argentine antLinepithema humile), the erratic ant, the odorous house ant, and the cone ant. This subfamily is distinguished by having a single petiole (no post-petiole) and a slit-like orifice, rather than the round acidopore encircled by hairs that typifies the subfamily Formicinae. Dolichoderine ants do not possess a sting, unlike ants in some other subfamilies, such as Ponerinae and Myrmicinae. This subfamily is not currently divided into tribes, but there are 24 genera. Looks like you've been in a beautiful place. Too bad you couldn't have explored it more. Love your turquoise-tailed friends. Isn't this tech amazing that your bug could travel the cyberworld? Jeez, honey...how long are you gonna be there? The States are sadly diminished without your presence. We live in a beautiful world. Thank God for nature blogs. What a great example of how technology has shrunk the world for us! So you'll be home soon. 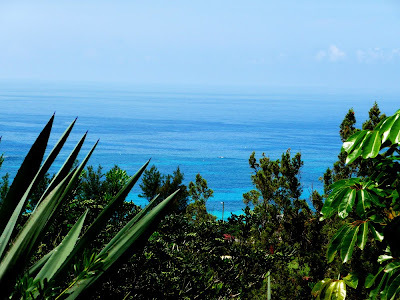 It seems you've been far and away for so long...but still nearby :o) Lovely post and I wish I were there to take a break away from mail merges and absorb the beauty there with you. This is not only a great community of nature lovers, it's a community of comics. I love it. Tim, you are a great interviewee. No wonder FTFN is syndicated all over the place. Looks like you'll be home for a little while now - I'm sure that's a relief. Hope you have a safe return home. Love those pictures of the lizard and that sky... WOW! Congrats on the Nature Blog feature. You deserve it as your blog is always exciting, vibrant. Hope all is well. Have a nice day. I guess you made most of the opportunities that your hotel provided you. 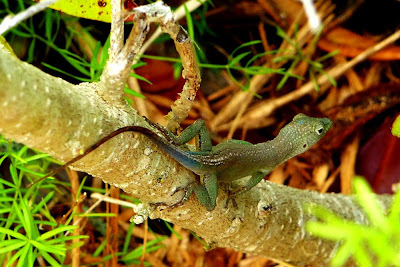 I like the colorful lizard images and congratulations on getting featured on nature blog network. I love how many ways you subtly show in this post that technology can be used to bring us closer to nature. These are heady times indeed for connected naturalists! Love it! You have all the makings of a super myrmecologist, TR. And by the way, the ginormous queen ant Mike's holding in the flask is a leafcutter, genus Atta. I add my congratulations1 You deserve the recognition.I think it's amazing how small the world has become...anything, anywhere, anytime. What ever you need or want. Crazy!! Keep up the great views. How very cool..Communication these days is amazing..and you are right..this nature blog network of people are great! You were truly from the faraway nearby in this post! Lovely post, with so many messages about nature and human nature. Love the bug ID, the sharing, the incorporation of blogging friends in a special testament to technology, the Nature Blog Network and the depth of human nature. I love your turquoise anole friend and how you pointed out that "We live in a rich, rich, colorful world -- if only we would take time to notice it." It is surprising how we can take things for granted, even colors. Your site and the wonderful realm of nature blogging reminds me to use all of my senses when out in nature. Hope you are doing fine. Am a regular reader of your blog and am interested in promoting my hotel on your blog. It’s a top 5 star luxury hotel in Bali (Indonesia) named as "Damai Lovina Villas". Bali is known for being the most popular tourist place all over the world. Your posts are so thoughtful and rich. I imagine all the time you spend just choosing one word. That was amazing about Debby's husband. And, the sweet references to your turquoise friends. That one photo of the purple sky. Just divine. And, last but not least, the reference to moldy carpet and overly perfumed. It brought back so many memories. Goldamn I love this post!!! Sorry it took me so long to read it. Whipping the ant to Panama from Bermuda via Oklahoma is toooo cool. LOVE IT!! There are various different methods of Japanese knotweed removal. Using a Japanese knotweed rhizome barrier may be one of the methods to prevent the local spread of the plant. This will prevent the spreading across a land boundary as the barrier is buried along the required margin. The barrier is comprised of a thick sheet of plastic that cannot be penetrated by underground growth of the knotweed. It was extremely interesting for me to read that post. Thanks for it. I like such themes and everything connected to this matter. I would like to read a bit more soon. Interesting article as for me. I'd like to read a bit more about that matter. Top site, I hadn't noticed www.trryan.com earlier during my searches!